Nathan grew up in rural Cook County, MN, in the Boundary Waters Canoe Area, where his father was a Lutheran camp director, and urban Minneapolis, where his father ran a youth center. He sang, played piano, guitar, flute and saxophone as a kid in school and church groups. This lead to playing in many diverse groups from folk to Latin to jazz, and of course, R n" B, blues and rock. Nathan’s life has been greatly enriched by his Norwegian and Sami family. He has been the co-editor of Baiki, the International Sami Journal for 15 years, and has performed at many Scandinavian festivals doing Sami Yoik (traditional singing) and original folk music with guitar. Nathan has been fortunate to meet and learn from many Yoik performers visiting North America and visiting Samiland. These experiences are reflected on his first CD, "Seven Little Wonders". He calls this "folk music", " Latin, Saami n’ Western Folk Music". He has warmed up Bonnie Rait, Los Lobos and others as band member. Nathan’s ancestral family comes from Snaasa, in Nord Trondelag, and Lofoten area, Norway. You can find his music at nathanmuus.com, and Sami cultural information at Baiki.org. Nathan is accompanied today by Will Williams, who has backed up Debarge, The Whispers and many others. 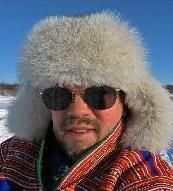 Enjoy Nathan’s mix of Saami, folk and contemporary sounds. "Yes his joiks are great also....I especially like Oktavuota/Getting Together, and Dure Ingga Dure...totally fantastic..!" Berit Oskal musictips blog, Kautokeino, Sapmi, Norway. (Berit is well known Sami Yoiker with CD's herself. Her theme is- "Whatever the question, joik is the answer...."). "Wow, we loved this CD! The variety is great, the music is liveley, beautiful and interesting. We especially enjoyed the yoiking (traditional Saami singing)...and the song "When Will Wars End" -Bill Musser, Vesterheim Norwegian-American Museum, Decorah, IW; musician in the "Foot-Notes".